These are best practices to follow in the delivery of your elevator speech. Elevator speeches are 30 to 60 seconds long—no exceptions! 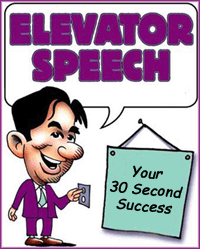 The two example elevator pitches we constructed in Does Your Elevator Speech Go to the Top Floor take 35 seconds for the decision maker speech and 38 seconds for the speech to another job seeker or networker. Each is exactly 90 words. If you are not prepared and compelling in your delivery, you'll lose your audience after about 30 seconds. Always maintain eye contact with every word you speak. Talk to the person, not the wall, not the floor or the lampshade just beyond their shoulder. And never, ever, ever look at text messages, emails or answer your phone while delivering your speech. Practice in front of a mirror looking at yourself in the eyes. If your eyes wander, then you did something to distract your own attention which is exactly what your audience will experience. 1. Speak up and project your voice so your audience does not have to strain to listen to you. Your vocal tone and emphasis translate into confidence. SMILE! Sit up straight, lean slightly forward to engage with the person. Avoid a kick-back-Jack relaxed appearance, don't slouch, don't cross your arms, keep you hands out of your pockets, and no twirling pens in your fingers. Keep your hands to your side or on the table. Don't fidget and don't allow your hands and fingers to wander around. It is a distraction. The ultimate goal in your delivery is to come across to your audience as the prepared, competent, mission focused professional that your are. How do you achieve such a high level of excellence in your delivery? PRACTICE, PRACTICE and PRACTICE. Ask someone to critique you and then...PRACTICE AGAIN! I tell people this all the time. Funny, you never hear this type of info unless you are actively seeking self-improvement. It is not generic ‘out there’ info.